When I got home from work last night I wasn't in the mood to run a game. I gave serious thought to letting one of the other game masters take the lead, so that I could sit back and zone out. Due to some unplanned work travel I didn't have time to finish preparing Escape from the Purple Planet (a 0-level funnel) for our monthly Norwin Game Knights club event. I certainly didn't have anything prepared for our semi-regular Crawling Under a Broken Moon campaign. Fortunately for my player characters, I have a wife (+Jennifer Walls) who doesn't let me hang up my Judge's Screen when I'm whining. With only ten minutes to spare before heading over to our monthly event, I collected my Dungeon Crawl Classics stuff, some Rory's Story Cubes, my big, printed Future Armada: Cygnus map, and my D&D and Star Wars miniatures. Our last adventure ended on the deck of a starship, far above the fantasy world of Caribdus. Not exactly a typical starting off point for a fantasy RPG. I was gonna wing it... and I'm so glad that I did. Fast-forward to the end of our session, and my players were walking away from the table grinning ear to ear. "Now THAT'S how you play an RPG" and "Best. Game. Ever!" were two (of many) positive comments that I overheard while packing up. In less than three hours I went from "ending a bad day" to "starting a glorious weekend." This is why I love our hobby. As a Goodman Games World Tour event, we must always be ready to bring new players into the fold. This month we introduced new PC's as prisoners of the wicked Visitors. Fred can cast Magic Shield as an Elf or Wizard. Fred can perform a tentacle lashing for 1d4 damage. Singing: As an action Fred can start singing. This grants an additional d3 in damage on it's next attack roll. Fred's player must sing for this to work. If Fred's player can get other players to sing too, Fred gets +1d for every singer up to a maximum of a d8 in bonus damage. Fred +5 singers: 1d8 extra damage. ... On a recent mission to the world of Caribdus, the Visitors discover that a small team of space pirates (the player characters) unexpectedly teleport into their port cargo bay. 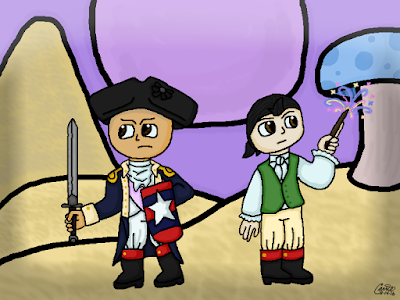 The Visitors send in their space marines to handle the space pirates, as well as some escaped captives from the world of Caribdus. During the clash, the space pirates meet a singing tentacle named Fred, who proves to be a valuable asset. After defeating the Visitor space marines in a terrible battle that costs many lives, the space pirates start exploring the starship. They find a central chamber with twelve escape pods. Although escape is briefly discussed, the adventurers decide that they would rather capture the vessel and keep it for themselves. Moving up to the second level of the ship, the space pirates fall into a trap! The Visitor captain and his crew attack the pirates from all sides. Through strength of will, and quick thinking the space pirates fend off the Visitor crew, while Lord Old Man Legolas of Ikea and Fred (singing loudly) chase down and kill the Visitor captain. After commandeering the Visitor starship, the space pirates rename their new vessel the Tentanic. During our last session I claimed that the PC's were on the deck of the USS Enterprise (J.J. Abrams version.) I'll admit that I retconned that story during this adventure. 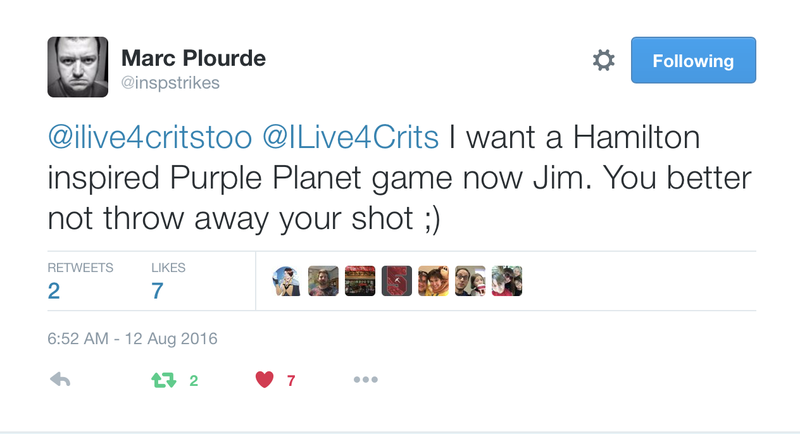 My original plan was going to involve a holodeck version of People of the Pit, but with 3rd level PC's we may attempt an early visit to the Purple Planet this fall. Visitors: As Lizardmen, but armed with light blaster pistols (1d6 damage). Visitor Marines receive two hit dice and are armed with blaster rifles (1d10 damage). At one point in the evening I mentioned the phrase "Go ahead, make my day." Carrie asked me where this was from, and I told her it was from Dirty Harry. "Is that a 'South Park' thing?" she asked. I have failed as a parent. If you think the Cygnus map was cool, make sure to check out more of 0-hr art & technology's incredible starship maps. Not only are there deckplans, but also great artwork showing the outside of the ships. 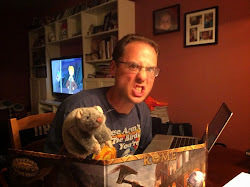 In case you're wondering, +andrew lyon is going to be making up Fred as a Bard using Crawl! #6. I think a Tentacle Bard is just what this campaign needed. "He's already dead? We didn't even start yet!" - Michael's not used to the short life-span of 0-level characters. "I once died opening a door. DCC can be like that." - Carrie explains the beloved themes of the game. "Look at me! I'm the captain now!" - LOMLOI to the Visitor Captain. "I'm pretty sure this is the best game in DCC history. It had singing tentacles!" - Carrie uses the "singing tentacle test" to compare all DCCRPG adventures. ... and start getting real. The Real World: Sunken City! In most role-playing games, the introduction of a second Cleric into the party goes unnoticed. Dungeon Crawl Classics is not that kind of game. After losing his beloved Dwarf Bellows during the last session, +Marc Plourde showed up with his new Cleric: Ichabod Crane. Marc used the new Crawling Revolution Occupation List to come up with Ichabod, who started his life as a potato farmer. While farming his small patch of potatoes outside a Sunken City keep, Ichabod dug up a giant, cephalopod shaped potato, with tentacle-like roots sprouting from one end. It was a sign... a sign from Cthulhu... that Ichabod was "chosen." And so, Ichabod Crane, potato farmer, placed the great Potathulhu into his sack, created a holy symbol of Cthulhu, and began preaching the good word of the dark lord. The Free Company allowed Ichabod into their party following an epic battle against to free the River Keep. Ichabod had been kept prisoner there by Woart Redhelm. The Free Company's other Cleric, Ssof Rehtaf, hadn't been present during the battle, but was instead taking care of business back at Slither's End. When Ssof, priest of Aristemis, came to join his companions, he instantly clashed with the champion of Cthulhu. At some point last night the topic came up that Aristemis was perhaps a goddess of the hearth as well as all-seeing and such. So when we started describing Ichabod's spells as manifestations of the holy potato, featuring demonic french-fry visions of hell, it didn't take long for us to bring up Ssof's hearth-based deity as a prophet of brick-oven pizza. Pizza versus fries... make your choice! The Free Company, now in possession of a rustic river keep (Castle Bellows), does some book keeping before continuing on their quest to uncover the secret of Jonas Gralk and his mother Clotilda. The group's new cleric, Ichabod, places Or Ida, a member of Cthulhu's lay clergy, in charge. The thirty peasants of Castle Bellows are directed to conduct fishing on the river with a single rowboat, and farm a six-hundred square foot potato garden. Ssof discovers the object of Ichabod's devotion, the great Cthulhu shaped potato (potathulhu) and attempts to smash it with his hammer. He misses, but this causes a cold-war between the two clerics. Before departing, one of the peasants informs Watson that, during his absence earlier in the day, a strange hooded man came calling. The figure had skeletal hands and a staff topped with a bird skull, but his face was unseen. When he found out that Watson was not there, he kept muttering about it not being "the right time." The Free Company sets out for the Unusually Large Tree to the northwest, hoping to find more clues to Jonas Gralk's whereabouts. En route they are beset upon by a quartet of Dirty Centaurs. Although well armed, the Dirty Centaurs aren't able to deal with the combined magical might of two clerics, a wizard, and an elf. While going through the gear of the Dirty Centaurs, Imric finds a wooden wine box. He opens the box, but a deafening "metal scream" blasts his ears, causing him to drop the box. This is found to be sacred Ur-Hadad wine, most likely an offering to the Metal Gods themselves. Nik-Nik calls for the party to get out of the way during a rain of watermelon sized acorns. Only Imric pays attention, running to the side while the rest of the party just ducks and gets thwacked. When asked about Jonas Gralk, Nik-Nik points east and tells the party that they may be able to find him in that direction. The Free Company also asks Nik-Nik if there is anything else of worth at the Unusually Large Tree. Nik-Nik claims to know several caves beneath the roots, and offers to lead them to one. The root cave is corrupted and fleshy. Entering the organ-like caverns below the roots, the party finds a small network of orifices. Scanning with detect evil and detect magic spells, the party notes evil to the north and east, and magic to the west. The "mouth" to the west leads to a dripping pool of Blood Syrup that causes skin to harden and turn to bark. Nicodemus tries drinking the sap, but has his flesh fall off as his immune system rejects the toxins. While being healed, the party hears noises behind them. At the end of the battle the party takes four Squirrel Demon eggs. That'll go well. It came up during play that the prophets of Aristemis have an entire book that foretells a terrible calamity by the hands of Cthulhu and his priests. Ssof recalls the book to be titled the Book of Idaho. Perhaps a future artifact? The Dirty Centaurs are a reference to an old Saturday Night Live skit featuring Christopher Walken giving a centaur a job interview. Statistically Dirty Centaurs are identical to normal centaurs, but filthy and ill-tempered. They tend to take up lives as bandits, short-order cooks, and sanitation workers. Stank Poultice: Fort Save, DC 5. Success, heal 1d14 hit points. Failure, cause 1d14 damage. I created the Root Cave to amp up the danger for a party of 2nd level characters. This area is not in the original adventure. Squirrel Demon (Type 1) Init +1; Atk Bite +3 melee, 1d8 dmg; AC 14; HD 3d12; MV 30'; Act ; SP Special Attack: Swallow Whole (Squirrel Cheeks, DC 12 to escape, 1 dmg/rnd while inside), demon traits; SV Fort +0, Ref +2, Will +0, AL C.
Imbibe, Fort Save DC 15, Skin hardening. Fail lose 1d3 stamina permanently. Success, gain +1 AC permanently. Cannot be consumed more than once. "Looks like mashed potatoes are back on the menu, boys!" - Nicodemus makes the first potato quote of the night. "If Aristemis says smite the potato, I'm gonna smite the potato." - Andy is going after that tater! "The potathulhu is not tainted!" - Ichabod Crane proclaims. "That is one dirty centaur." - Marc is right. "You told me the Fairy Stomper is +5 versus people with multiple butts!" - Andy quotes the Judge who did indeed make this statement in jest. Now it's canon. "It's not my fault your eyes don't work." - Imric, blessed with infravision, mocks the rest of the party. "Wait, wait, wait, I took a taste first. I'm putting it on pancakes if I like it!" - Nicodemus eats the blood sap. "I love how the Judge says 'who is the last one in the room', and now everyone is in the front of the party." - Paul kept getting screwed over on party order last night. Not Throwing Away My Shot - by +Carina W.
It started as a simple tweet from +Marc Plourde about mash-ups. My first thought was revolutionary war heroes fighting for freedom from H.G. Wells style Martians. 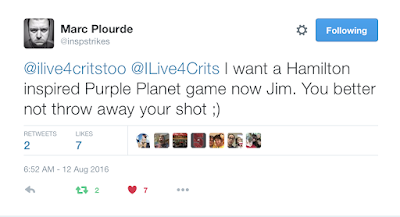 Marc reset the scene to +Harley Stroh's Purple Planet. Quickly my mind's eye filled with the image of George Washington and Alexander Hamilton wandering through mushroom forests and pinkish sands, chased by giant worms. I needed to run this game! First, we'd need a list of starting occupations... sort of. What if the list included actual historical figures? Now that would make for an extraordinary Dungeon Crawl Classics experience! After jotting down a half dozen Founding Fathers, I realized that this task was far to big to tackle alone. So as I've done before, I reached out to the DCCRPG G+ Community for feedback and input. As always, the community came up with extraordinary ideas! I should note that both my daughter +Carina W. and I listened to the Hamilton - Original Broadway Cast Recording non-stop while wrapping up this blog post. Lin-Manuel Miranda's production, which we first listened to during our trip to Gen Con 2016, was quite inspirational, as was the HBO mini-series John Adams. Earlier today, while compiling all the fantastic contributions from the G+ community, +Jennifer Walls and I binge watched the last three episodes. Ready for a history lesson? Each name below features a link to a Wikipedia page, article or corresponding website to give some background on the figure. Everyone may know John Adams or George Washington, but perhaps you've never heard of Caesar Rodney or Dicey Langston. To help clarify some of the inclusions, we noted the source, historical or fictional, where applicable. Please note that this list is not intended to be 100% serious or historically accurate. Simply scroll down to Benedict Arnold's Trade Good, and the tone for this table's use will quickly become apparent. You'll see that some of the Trained Weapons include blackpowder firearms. Crawl! has you covered! Crawl! Fanzine No. 8 features rules for these weapons, so make sure to head over to DriveThruRPG and grab your download. Totally worth it! Want a PDF version for use at your table? Thanks to +Jarrett Crader, here's a download link! I was originally aiming for thirty personas, but I'm so glad we got to fifty. Thanks to all the contributors for your incredible ideas. I've also gotta thank my wife Jennifer with helping me flesh out some of the details. Finally, I need to thank my daughter +Carina W. for the fantastic cover art. You totally captured the feel of this post! Living 4 Crits at Gen Con 2016!